The C86 scene was a loose gathering of post-post-punk bands on UK independent labels, diverse in sound but united in DIY attitude, and so called after an NME cover-mounted cassette which showcased a strong Scottish contingent in Edinburgh's Shop Assistants, Paisley's Close Lobsters, Bellshill's Soup Dragons and Glasgow dons Primal Scream and The Pastels. Thirty years later, the wistful, melodic, lo-fi C86 sound retains its cult appeal, including among fans and musicians who weren't even born when Bobby Gillespie first flicked his floppy fringe at the Splash One indie disco. 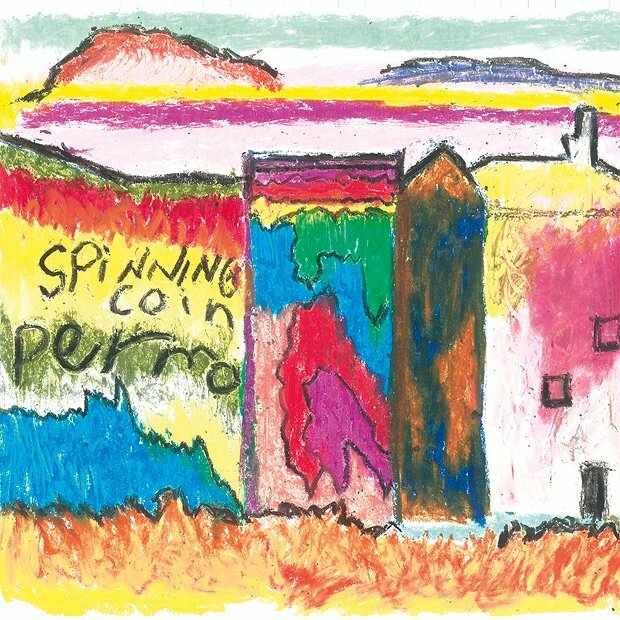 Glasgow five-piece Spinning Coin are spookily attuned to its aesthetic and, appropriately for a band so steeped in the city's DIY tradition, their debut album has been touched by the hands of two Glasgow indie legends. Pastels frontman Stephen McRobbie has been a mentor figure for the band since their inception; now, he is also their label boss. And Permo has been produced by no less a figurehead than Edwyn Collins. Neither veteran is going to back a shoddy horse; Permo is a flattering tribute to their indie pop trailblazing. From the opening leisurely strum of 'Raining in Hope Street', its whimsical romanticism, weedy vocal and chiming guitar is a portal to a time when indie actually meant independent. The group are fronted by a contrasting vocal tag team. Sean Armstrong sings in the beseeching, childlike style of Daniel Johnston and writes delicate, dreamy but astutely arranged indie pop songs, from the lyrical picking on 'Metronome River' to the woozy, slightly off-kilter psychedelia of 'Starry Eyes', which are reminiscent of the softer Teenage Fanclub numbers. Jack Mellin's contributions, such as the raw rant of 'Sides' and the low-slung New York punk attitude of 'Magdalene', are offspring of the more strident, punky and politicised end of the C86 sound such as the wiry Wolfhounds. The pair alternate throughout, each tempering the other's distinctive style in a sweet/sour combination which is prime nostalgia for old bowlies as well as being commendably independent of many of their peers. Out Fri 10 Nov on Geographic.